Another vest based on the sample from the Metropolitan Museum of Art’s Collection. 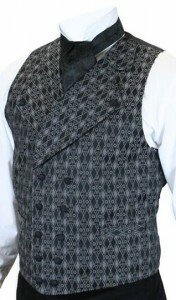 Dated to the 1830’s our Ashby vest has a unique wide lapel and narrow double breasted placket. In the ever popular black and gray color scheme. Enjoy! ← Do You Feel the Need for Tweed?